Google seems to be rapidly gaining users and popularity and perhaps even becoming a threat to Facebook and other social networks. According to Gundotra, Google already has 500 million registered users, of which 135 million are active. In order to find out more about Google Communities and how you can create your own community, check this page. We regarded the launch of this new Google feature as a good opportunity to create a group, through which we can test out and discover all functions and uses of the new Google communities. 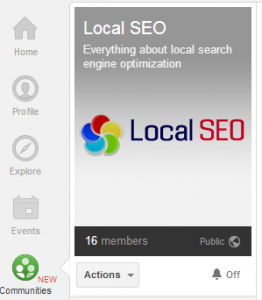 Thus, we launched an international group dedicated to Local SEO experts and enthusiasts. The main aim of this community is to gather in one place all people are connected to the Local SEO and SEM industry and wish to ask questions and participate in discussion on this topic. So, if you’re into Local SEO and intend to participate in any future discussions or simply want to stay connected to news and findings concerning Local SEO or Google Local, you’re warmly welcomed to join us on the Local SEO Community on Google . Dorothea Kettler is a great deal of things compressed in just one person. Currently 22 years old, she graduated from high school in 2009 and has been active as a freelance SEO consultant for the past 4 years.